A mid-week Fourth of July is upon us once again. As people across the country are preparing patriotic parades, backyard barbecues, and dazzling fireworks displays, managers and business owners are left with the challenge of structuring another atypical workweek. While a Wednesday holiday is a relatively rare event (here's a complete list of federal holidays for the next few years), many questions arise for employers when it does occur, such as: which employees are working this week? How much should I pay my employees? And should my business even stay open? A mid-week holiday can wreak havoc on employee scheduling if improperly planned. Therefore, as a manager, try to stay in the loop as much as possible. Typically, when a holiday falls on any other day of the workweek, employees only have to spend one day of vacation time to enjoy a four-day weekend. But when the holiday falls on a Wednesday, employees are faced with a bit of a dilemma, since they must decide whether to come in to work on Thursday or Friday, or to use two full days worth of paid time off (provided the business stays open during the week). As such, a Wednesday holiday makes vacation time uncertain. To help ensure everything runs smoothly, keep a sharp eye on the scheduling. While some businesses have policies that require employees to notify vacation time requests far in advance (sometimes months ahead), many small businesses simply have a "just let me know" approach. Therefore, try to keep track of all last minute requests as best as possible, and establish a cut-off window, if not already in place. If you're a manager that uses Webtimeclock, be diligent in checking your employee's timecards for any comments requesting paid time off (PTO). Last minute requests happen all of the time. The sooner you know your employee's plans, the better. While a mid-week holiday usually calls for creative scheduling, staying organized and communicative will make everything easier. In addition to scheduling, make sure you're properly paying your employees this holiday week. According to the Department of Labor, the Fair Labor Standards Act (FLSA) states that employers are not required to give employees PTO for holidays or vacation time. Furthermore, employers are not required to provide compensation for working on holidays, such as double pay. Any benefits given are to be mutually agreed upon by the employer and employee, usually through a contract at the start of employment. Although federal laws generally treat holidays as any other workday for private companies, the vast majority of businesses typically adhere to some form of holiday pay and employee compensation. In fact, the Bureau of Labor Statistics conducted an employee benefits survey in 2017, and revealed that 94% of private industry employees received Independence Day as a paid holiday. Additionally, private industry workers were given an average of 8 paid holidays per year. Even though federal laws don't require paid holidays, most businesses offer these incentives because they value their employee's wellbeing and retention within the company. Therefore, if you're a business owner deciding on how much to pay your employees this week, definitely consider offering paid holidays, or some form of compensation (such as double time) if your business remains open. You'll stay on better terms with your employees, and they will more than likely continue working with you in the future. Worth noting: If your business offers a paid holiday and an employee's vacation time overlaps, for example a vacation from July 3rd through July 6th, make sure you credit the PTO for July 4th back into the vacation time reserves for that employee. A paid holiday shouldn't be deducted from accrued PTO (unless otherwise stated in a contractual agreement). While schedules and payments can become a challenge during a mid-week holiday, business owners need to ask themselves, should we even stay open this week? Given the nature of a mid-week holiday, people will be taking vacations throughout all parts of the week (first half, second half, whole week). And unless your business is in the food or recreation industry, you're more than likely going to see a slow down in sales. Embrace the slow down and take some time off. As a business owner, manager, employee, etc. you've been working hard all year. Take this opportunity to get outside, hang out with friends and family, and give yourself a break from the daily grind of a busy work life. You deserve it. 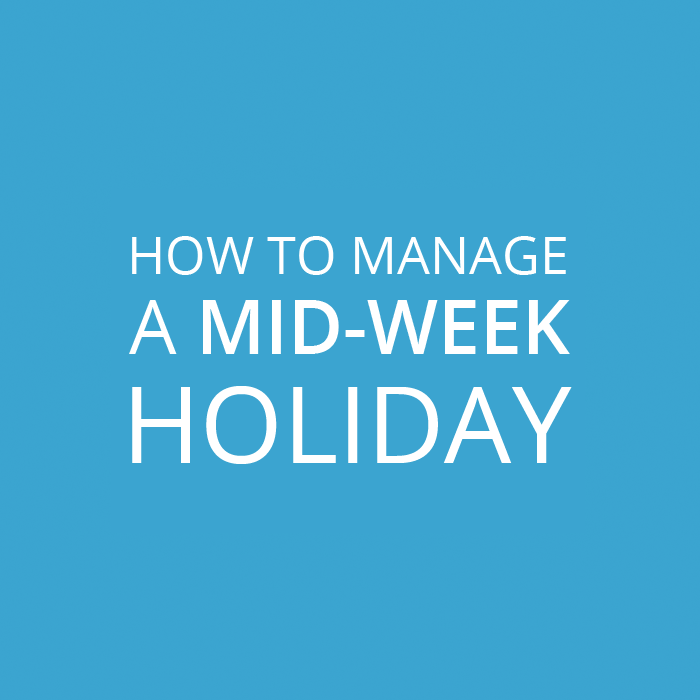 For business owners, a mid-week holiday may feel more stressful than fun when planning out the week. As your employees decide which days to take off, make sure you attentively watch vacation time requests, manage PTO/compensation pay, and carve out some time for yourself. While a mid-week holiday may not feel ideal, if planned right, it can be a positive and stress free experience.